I remember 2013; I was excited about Bitcoin and dove in head first to learn as much about it as I could, even though my friends and gf told me I was crazy. Hahaha. Blockchain consumed most of my free time and by early 2014, my mind was racing with all the potential that blockchain could unlock. It was then I stumbled into NEM’s community and haven’t looked back. Everything about NEM was different…the devs, the community, the vision. It deeply resonated with me and I fell in love with this project. I joined the call for participation, made NEM’s first Facebook page, and started making posts on the BitcoinTalk forum and other places to promote NEM. Little did I know how much NEM would become a part of my life. Since 2014, my role has grown from social media to include writing our blogs and updates, architecting Supernodes, championing the Community Fund, overseeing wallet development with Mixmaster, helping with early website designs with Saul, making Apostille with Jimmy, creating the Voting standard with Sergi, and finally helping Lon to start the Foundation in the role as Vice President and expand awareness across the world. I’ve met many wonderful people, watched the blockchain industry grow exponentially, and have seen NEM evolve from a project where people used to mock me over my passion for blockchain to now having people asking me how they can be a part of this movement. It’s the third-year anniversary of launching NEM and Catapult is soon to be released. I can’t tell you enough how proud I am to be a part of NEM. Fast forward to today. It’s been a really busy time, a bit busier than I would like it to be. As some may know, I’m not always in the best of health with Crohn’s Disease and have been away from America for more than ten years. I’d like to take a break to focus on some other things, see my family, rest and rejuvenate. As of today, I’m resigning from my role as Vice President of the Foundation and moving into a new advisory role where I can better manage my time, health and relationships. I’m not going anywhere and my passion for NEM hasn’t diminished. If anything with my experience and reflection, it’s becoming more focused. I plan to expand my work with LuxTag and Kchain, improve the Voting protocol and Apostille protocol as Catapult furthers in development. I’m also working on other ideas for additional protocols in addition to these that Catapult will enable. For me, these are exciting things that I want to work on and so I’m making that happen starting today. All the foundation members have been supportive, and I want to especially thank the NEM devs, Jaguar0625, Gimre, and BloodyRookie for all their hard work. Without them, we would have no great technology to rally around. Their vision of what a blockchain could and should be, continues to inspire me. I hope you feel as hopeful for NEM’s future as I do. 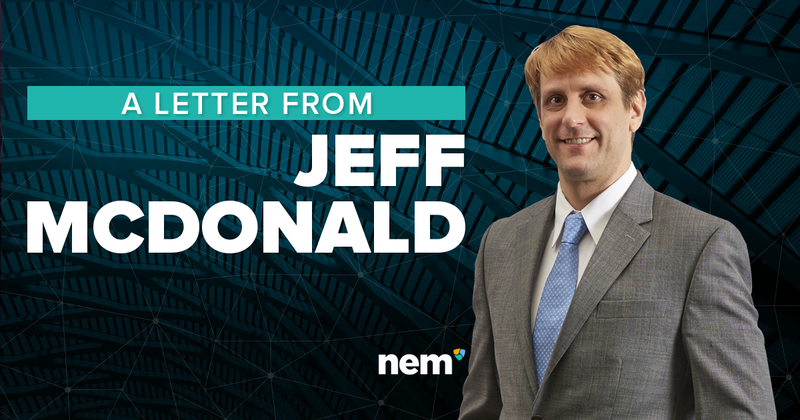 Being a part of NEM is one of the best things I have done in my life, and I encourage everyone to find their own path to help us build, market, and spread the word.